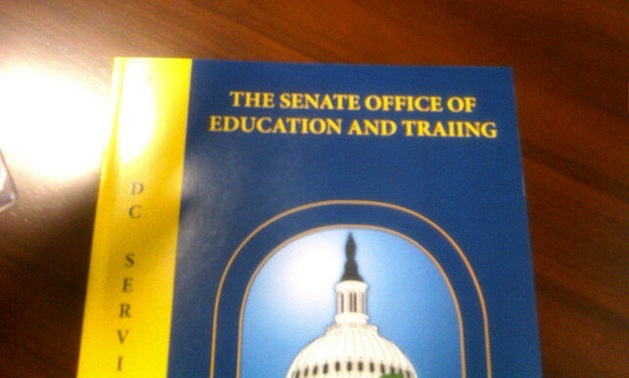 The Senate Office of Education and Training dropped off new manuals around Capitol Hill Friday, and aides quickly noticed that something was a bit off. "Look what came across my desk with a glaring error! Bet they'll reprint 'em!" tweeted Sen. Rand Paul spokeswoman Moira Bagley, who took the photo above. The booklet is a training directory for staffers on Capitol Hill. "Ooh! They've got an editing and proofreading class!" she said in a later tweet. Terrance Gainer, the U.S. Senate Sergeant at Arms, who oversees the Office of Education and Training, said they are fixing the problem. "Not much I can say about the mistake you discovered other than follow a very sound theory: 'mess up, fess up and clean up,'" Gainer told Yahoo News. "The error is being corrected."